Preface. 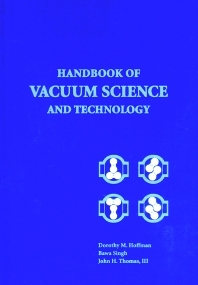 Fundamentals of Vacuum Technology and Surface Physics: B. Singh and J.H. Thomas, III, Vacuum Nomenclature and Definitions. Gas Properties. Molecular Processes and Kinetic Theory. Throughput, Pumping Speed, Evacuation Rate, Outgassing Rate, and Leak Rate. Gas Flow. Conductance. Flow Calculations. Surface Physics and Its Relation to Vacuum Science. Creation of Vacuum: M. Hablanian, The Technology of Vacuum Pumps--An Overview. F.J. Eckle, Diaphragm Pumps. J. Richman, Blowers. Vapor Jet Pumps: M. Hablanian, Diffusion Pumps. G. Ash, Cryogenic Pumps. H. Henning, Turbomolecular Pumps. J. Singleton, UHV Pumps. Vacuum Measurements: H.M. Brady, R.H. Goehner, E. Drubetsky, and W.H. Bayles, Jr., Measurements of Pressure. L. Lieszkovszky, Mass Analysis and Partial Pressure Measurement. R. Outlaw, Analysis of Partial Pressure Information. L. Hinkle, Gas Flow Measurements. Systems Design and Components: Components for Vacuum Equipment and Systems: N.T. Peacock, Valves. N.T. Peacock, Flanges. W. Helgeland, Feedthroughs. C. Kraft, Ports. J. Panitz, Construction Materials: Properties Defining Material Performance. Vacuum Chamber Materials. Special Purpose Materials. R.N. Peacock, Seal Materials and Design. B. Dayton, Outgassing of Materials. J. Garner, Aluminum Based Vacuum Systems. D. Mattox, Preparation and Cleaning of Vacuum Surfaces. Vacuum Applications: High Vacuum Based Processes: S. Rossnagel, Sputtering. V. Patel, Plasma Etching. M. Powers, Ion Beam Based Processes. J. Cheung, Laser Ablation. F. Jansen, CVD and PECVD. J. Thomas, UHV Based Processes. Large-Scale Vacuum Based Processes: W. Robbins, Large Area Coatings. H.F. Dylla, The Development of Ultrahigh Vacuum Technology for Particle Accelerators and Magnetic Fusion Devices.